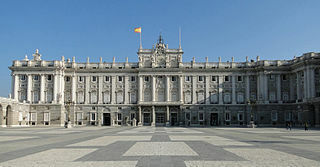 Royal Palace of Madrid (1738-1892). Estipite in the Church of Caravaca de la Cruz. As Italian Baroque influences penetrated across the Pyrenees, they gradually superseded in popularity the restrained classicizing approach of Juan de Herrera, which had been in vogue since the late sixteenth century. As early as 1667, the facades of Granada Cathedral (by Alonso Cano) and Jaén Cathedral (by Eufrasio López de Rojas) suggest the artists' fluency in interpreting traditional motifs of Spanish cathedral architecture in the Baroque aesthetic idiom. In Madrid, a vernacular Baroque with its roots in Herrerian and in traditional brick construction was developed in the Plaza Mayor and in the Royal Palace of El Buen Retiro, which was destroyed during the French invasion by Napoleon's troops. Its gardens still remain as El Retiro park. This sober brick Baroque of the 17th century is still well represented in the streets of the capital in palaces and squares. Facade of the University of Valladolid (1716-1718). Three of the most eye-catching creations of Spanish Baroque are the energetic facades of the University of Valladolid (Diego Tome and Fray Pedro de la Visitación, 1719), the western façade (or Fachada del Obradoiro) of the Cathedral of Santiago de Compostela (Fernando de Casas y Novoa, 1750) and Hospicio de San Fernando in Madrid (Pedro de Ribera, 1722), whose curvilinear extravagance seems to herald Antonio Gaudí and Art Nouveau. In this case as in many others, the design involves a play of tectonic and decorative elements with little relation to structure and function. The focus of the florid ornamentation is an elaborately sculptured surround to a main doorway. If we remove the intricate maze of broken pediments, undulating cornices, stucco shells, inverted tapers and garlands from the rather plain wall it is set against, the building's form would not be affected in the slightest. However, Churrigueresque baroque offered some of the most impressive combinations of space and light with buildings like Granada Charterhouse (sacristy by Francisco Hurtado Izquierdo), considered to be the apotheosis of Churrigueresque styles applied to interior spaces, or the Transparente of the Cathedral of Toledo, by Narciso Tomé, where sculpture and architecture are integrated to achieve notable light dramatic effects. The Royal Palace of Madrid and the interventions of Paseo del Prado (Salón del Prado and Alcalá Doorgate) in the same city, deserve special mention. They were constructed in a sober Baroque international style, often mistaken for neoclassical, by the kings Philip V and Charles III. The Royal Palaces of La Granja de San Ildefonso, in Segovia, and Aranjuez, in Madrid, are good examples of baroque integration of architecture and gardening, with noticeable French influence (La Granja is known as the Spanish Versailles), but with local spatial conceptions which in some ways display the heritage of the Moorish occupation. In the richest imperial province of 17th-century Spain, Flanders, florid decorative detailing was more tightly knit to the structure, thus precluding concerns of superfluity. A remarkable convergence of Spanish, French and Dutch Baroque aesthetics may be seen in the Abbey of Averbode (1667). Another characteristic example is the Church of St. Michel at Louvain (1650–70), with its exuberant two-storey facade, clusters of half-columns, and the complex aggregation of French-inspired sculptural detailing. Six decades later, the architect Jaime Bort y Meliá, was the first to introduce Rococo to Spain (Cathedral of Murcia, west facade, 1733). The greatest practitioner of the Spanish Rococo style was a native master, Ventura Rodríguez, responsible for the dazzling interior of the Basilica of Our Lady of the Pillar in Zaragoza (1750). Plaza Mayor in Salamanca (1729-1755), Alberto and Manuel de Lara Churriguera. Andrés Garcia de Quiñones designed the city Hall. Monastery of San Francisco de Asís, Lima, 1673. The combination of the Native American and Moorish decorative influences with an extremely expressive interpretation of the Churrigueresque idiom may account for the full-bodied and varied character of the Baroque in the American colonies of Spain. Even more than its Spanish counterpart, American Baroque developed as a style of stucco decoration. Twin-towered facades of many American cathedrals of the seventeenth century had medieval roots and the full-fledged Baroque did not appear until 1664, when the Jesuit shrine on Plaza des Armas in Cusco was built. Even then, the new style hardly affected the structure of churches. The Peruvian Baroque was particularly lush, as evidenced by the monastery of San Francisco in Lima (1673), which has a dark intricate facade sandwiched between the yellow twin towers. While the rural Baroque of the Jesuite missions (estancias) in Córdoba, Argentina, followed the model of Il Gesù (also the case of the Jesuit Church of St. Paul in Lima, provincial "mestizo" (crossbred) styles emerged in Arequipa, Potosí and La Paz. In the eighteenth century, the architects of the region turned for inspiration to the Mudéjar art of medieval Spain. The late Baroque type of Peruvian facade first appears in the Church of Our Lady of Mercy, Lima (1697–1704). Similarly, the Iglesia de La Compañia, Quito (1722–65) suggests a carved altarpiece with its richly sculpted facade and a surfeit of spiral salomónica. The facade of the church of Ss. Sebastian y Santa Prisca in Taxco (1751-58) bristles with Mexican Churrigueresque ornamentation. To the north, the richest province of 18th-century New Spain — Mexico — produced some fantastically extravagant and visually frenetic architecture known as Mexican Churrigueresque. This ultra-Baroque approach culminates in the works of Lorenzo Rodriguez, whose masterpiece is the Sagrario Metropolitano in Mexico City (1749–69). Other fine examples of the style may be found in the remote silver-mining towns. For instance, the Sanctuary at Ocotlán (begun in 1745) is a top-notch Baroque cathedral surfaced in bright red tiles, which contrast delightfully with a plethora of compressed ornament lavishly applied to the main entrance and the slender flanking towers (exterior, interior). The true capital of Mexican Baroque is Puebla, where a ready supply of hand-painted figurines (talavera) and vernacular gray stone led to its evolving further into a personalised and highly localised art form with a pronounced Indian flavour. There are about sixty churches whose facades and domes display glazed tiles of many colours, often arranged in Arabic designs. Their interiors are densely saturated with elaborate gold leaf ornamentation. In the 18th century, local artisans developed a distinctive brand of white stucco decoration, named "alfeñique" after a Pueblan candy made from egg whites and sugar. Earthquake Baroque is a style of Baroque architecture found in the Philippines, which suffered destructive earthquakes during the 17th century and 18th century, where large public buildings, such as churches, were rebuilt in a Baroque style. In the Philippines, destruction of earlier churches from frequent earthquakes have made the church proportion lower and wider; side walls were made thicker and heavily buttressed for stability during shaking. The upper structures were made with lighter materials. Bell towers are usually lower and stouter compared to towers in less seismically active regions of the world. Towers have thicker girth in the lower levels, progressively narrowing to the topmost level. In some churches of the Philippines, aside from functioning as watchtowers against pirates, some bell towers are detached from the main church building to avoid damage in case of a falling bell tower due to an earthquake. ^ "Antigua’s Environs – Antigua, Guatemala". BootsnAll Indie Travel Guide. Retrieved on 2011-07-06. ^ a b "The City of God: Churches, Convents and Monasteries". Discovering Philippines. Retrieved on 2011-07-06. ^ Finch, Ric. "Antigue Guatemala-- Monumental City of the Americas". Rutahsa Adventures. Retrieved on 2011-07-06. Kelemen, Pal (1967). Baroque and Rococo in Latin America (2nd ed., 2 vol ed.). New York: Dover. ISBN 0-486-21699-3. Smith, Bradley (1966). Spain: A History in Art. New York: Simon and Schuster.